Builders choose a method of attaching wood to stuccoed surfaces according to the function of the wood item. While construction adhesives suffice for mounting lightweight, decorative items, heavy or load-bearing items require direct fastening to wall studs or heavy-duty wall anchors. With a masonry drill bit, a standard power drill can bore through stucco to allow screws, lag bolts or wall anchors to grip the stucco wall. If you choose to use adhesive, use an adhesive that grips upon contact; contact adhesives set quickly so that you don't have to clamp or hold materials for a long drying period. Wall anchors or direct fastening to studs supports medium to heavy objects. 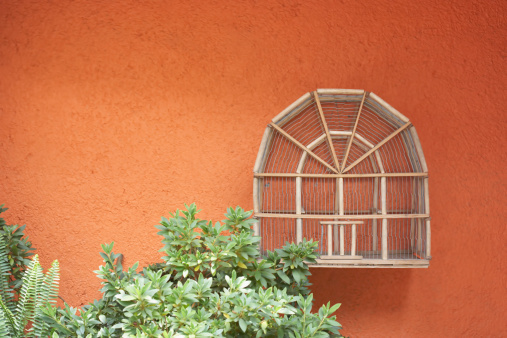 Use a scrub brush and cleaning compound on the stucco area where you intend to install the wood. Remove dirt, grease and grit. Wipe the installation area with a rag. Allow the installation area to dry. Clean the rear of the wood with a rag to remove debris and dirt. Read the instructions for the construction contact adhesive to determine the adhesive's set time; identify this time before applying the adhesive. Brush or squeeze adhesive onto the wall and onto the rear face of the wood. Press the rear face of the wood against the adhesive-coated stucco. Firmly hold the wood against the stucco for the duration of the adhesive's set time. Mark the location of the fastener on the wood's surface with a tape measure and pencil. Attach a wood bit to the power drill and drill through the wood at the mark. Hold the wood against the stucco surface at the desired installation location. Press a pencil through the wood's hole and use the pencil to create a fastener mark on the stucco surface. Attach a masonry bit to the power drill. Drill through the stucco surface at the fastener mark until the bit penetrates the wall cavity. Remove the screw from the toggle bolt's toggle. Place the screw through the hole in the wood and thread the toggle onto the screw. Insert the toggle into the hole in the stucco surface. Press the wood flush against the stucco surface. Turn the screw clockwise with a screwdriver to draw the toggle against the wall's interior. Continue to tighten the screw until the screw head rests flush against the wood and securely anchors the wood to the stucco. Locate studs with a stud finder from the building's interior or by stretching a tape measure from the exterior wall corner to the wall's center. Studs are typically spaced 16 inches on center. Subtract the thickness of the stucco layer and wall sheathing from your measurements. Mark the studs' locations on the stucco surface with a pencil. Attach a wood drill bit to the power drill. Choose a bit approximately equal in diameter to the smooth portion of the lag screw shank; the smooth portion excludes threads. Drill a hole through the wood. Attach a masonry drill bit to the drill. Drill a hole through the stucco at the stud mark; drill only through the stucco. Attach a wood bit to the drill. Choose a bit slightly smaller in diameter than the lag screw's smooth shank; this leaves enough wood for threads to grab. Insert the bit through the hole in the stucco and drill a starter hole into the stud; the starter hole depth is roughly equivalent to the length of the screw. Attach a nut driver to the drill. Align the wood's hole with the hole in the stucco. Mount a lag screw's head into the nut driver. Press the screw tip through the wood and through the hole in the stucco until the tip rests against the stud. Drive the screw into the stud until the screw's head pulls the wood flush against the stucco surface. How Do I Attach Items to a Stucco Exterior Wall?